Are you the proud owner of a new trampoline? Even if you’ve had your bouncy backyard companion for a while, it may need a revamp. And there’s no better way to spice up an old toy like adding new features. 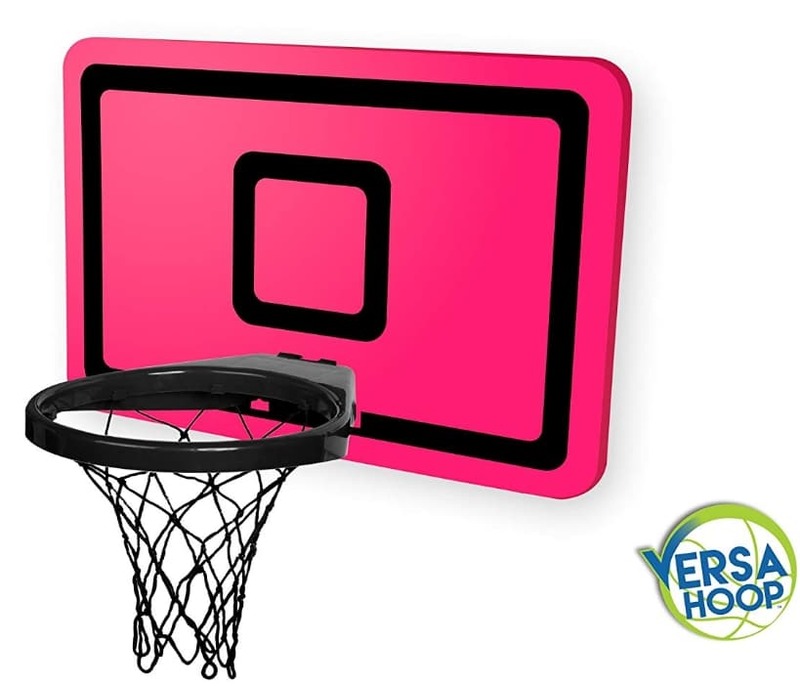 A trampoline basketball hoop is a perfect way to add a bit of pizazz. It keeps kids and parents alike interested, activated and moving around. But which one should you buy? Purchasing a trampoline hoop is no simple task. There are many things to consider. Entertainment, safety, ease of use — all these things and more must play a part in your decision-making process. Seem like a lot? It is. That’s why we’ve compiled this list of the top 9 hoops for you. LIFETIME Parts Warranty - If it breaks we'll send parts or replace it at no cost to you! 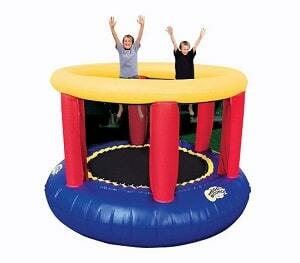 The Trampoline Pro Jump Slammer is a favorite among consumers. This hoop setup weighs at 8 pounds, ensuring you won’t have any difficulty setting it up. It comes with a universal connector able to attach to any enclosure pole measuring 1.5” or less. This model also comes with flexible rim technology. That means the rim of the hoop won’t pose a safety risk as kids are jumping around. If they do collide with the hoop, it will simply bend out of the way. The Pro Jump has its ball safety net, which helps keep the ball inside. 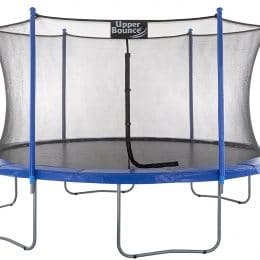 All parts are adjustable to fit your brand of trampoline. The VersaHoop Set is perfect for kids of all ages, and a truly remarkable feat of design. 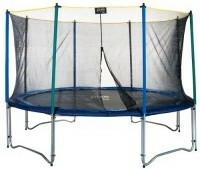 You can use the VersaHoop for your trampoline on a sunny day, and when it rains you can take the whole setup inside. It has clamps for both vertical and horizontal poles, and is easily detachable for when you decide to move it. The entire setup is easy to break down and take with you anywhere. At just 7 pounds, you’ll have a breeze setting it up. The VersaHoop is compatible with any safety net enclosure you may have. 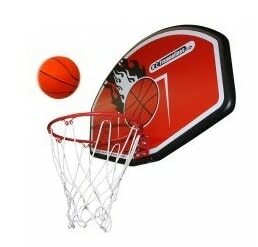 The backboard is sturdy and durable, allowing for rougher play and some really LeBron James-like moves. The breakaway rim ensures that your child will have a fun and safe playtime. All this for just a low range. That price is something we can definitely jump on board with. Top selling accessory for trampolines! Put years of FUN into your backyard! 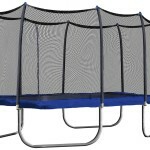 Features 4 durable ProFlex springs for endless hours of safe trampoline play! 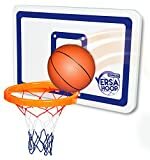 Padded, UV treated, 11" hoop with reinforced backboard. 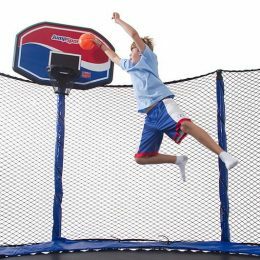 The Proflex Trampoline Basketball Set by JumpSport is one of the most durable trampoline basketball hoops around. The 11” hoop is perfect for kids of varying ages, and the Pro-Flex hardware is made to last a lifetime. You won’t have any safety concerns with the padded rim, and the strong reinforced backboard even allows for slam-dunks. 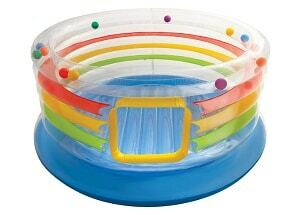 This is truly a five-star product capable of withstanding the onslaught of a children's’ trampoline basketball game. It even comes with a ball for playtime. It’s important to note that this model is not exactly universal. You must own one of three types of safety enclosures: JumpSport Elite, JumpSport Classic, or AlleyOOP. This product comes highly recommended by users, though it is the one of the most expensive on the list. 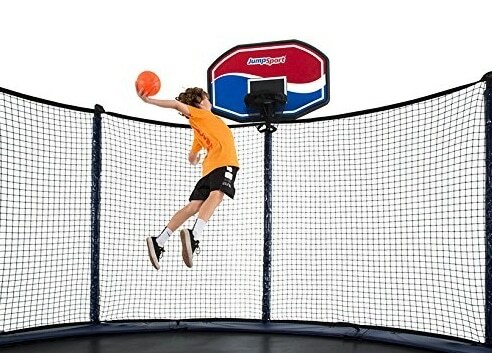 The AlleyOOP Proflex basketball set is designed for AlleyOOP trampoline safety net enclosures. 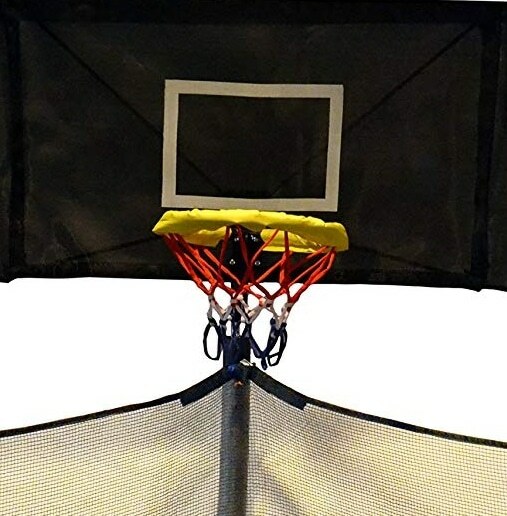 The backboard is a testament to trampoline basketball set design, with spring attachments on the hoop to support rougher play. 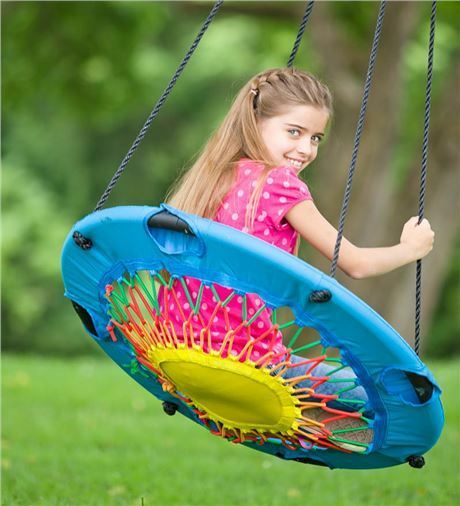 The hoop is cushioned as a safety feature to keep your kids safe at play all year long. The steel rim will last a lifetime. It provides safety springs which bend when struck by jumping kids, and won’t break away like other rims. This makes it last longer than many other rims on the market. The price tag is steep, but the product is extremely durable. You won’t need any replacement parts for this one. 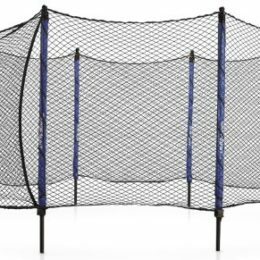 The JumpKing set is a modestly-priced hoop set able to be used with most trampoline safety nets. This set has a solid back panel which resembles a basketball hoop on an actual court, so this model gets lots of points for attractiveness. But it’s also safety-minded, with a padded hoop. The U-bolt technology makes setting up and taking down this basketball hoop a breeze. 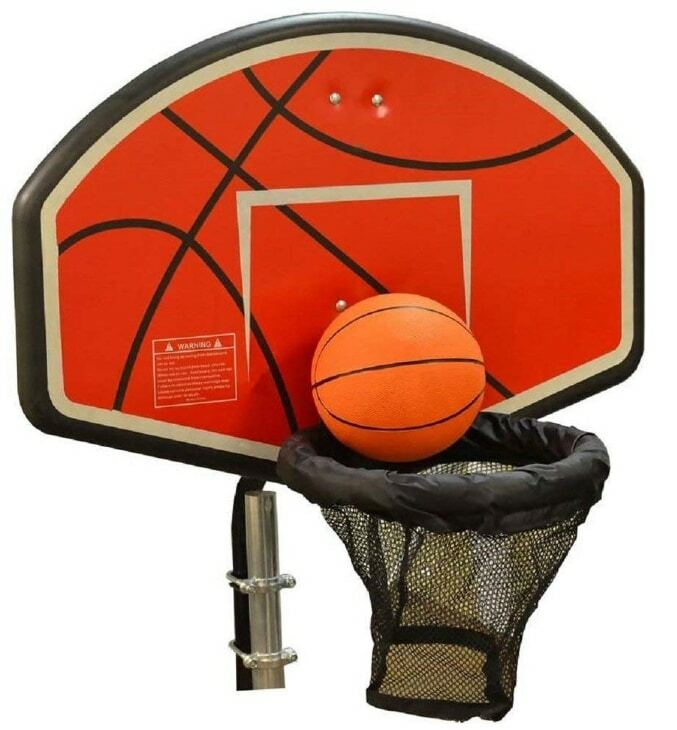 Although this trampoline basketball hoop is attractive and fun, some customers warned against slam dunks — be careful not to hang on the hoop, as it may break. This hoop is a light investment that will provide your family with hours of outdoor fun. 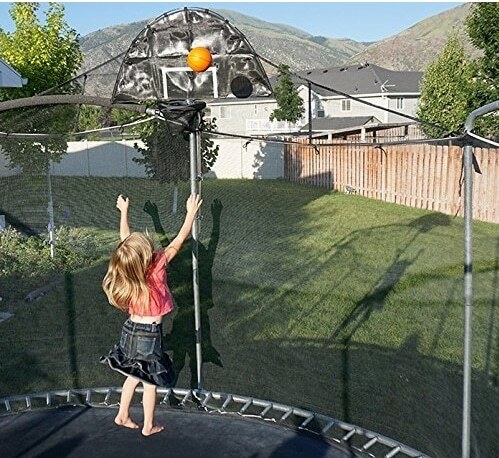 The Trampoline Basketball Set gets major points for being able to fit with any brand of trampoline and safety net enclosure system. It includes its own poles for assembly, allowing you to mount the hoop at varying heights. You’ll also get a free basketball with a pump included in the set. 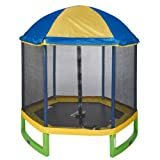 This trampoline set is a bit heavier at just under twenty pounds, so you may want to have some help setting it up. Great addition for multiple size trampolines straight enclosure pole. The Skywalker basketball set is great for your younger basketball stars. You’re able to use this setup with any trampoline and safety enclosure, as it attaches with strings and straps rather than clamps. The Skywalker basketball set is made with gentle fabrics to prevent injury. It has a breakaway hoop as a further safety precaution. The fabric is made with a weather-resistant material with added UV protection to withstand the elements. However, customer reviews indicate that you may want to bring it inside in case of inclement weather. Smaller kids will love it, but bigger ones can be a bit hard on the soft materials. This is not the basketball hoop you want to buy for playing rough. It’s very reasonably priced at low range. 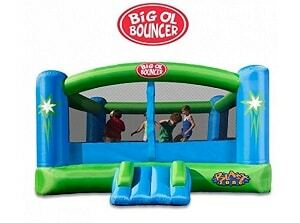 This includes the entire setup plus a basketball, so you won’t have to wait for backyard fun. 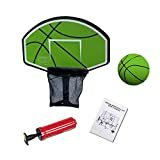 The Exacme basketball set doesn’t pretend to be anything other than mini. It’s small, but this product packs a mean punch. It’s perfect for parents who don’t want to break the bank on a basketball hoop. 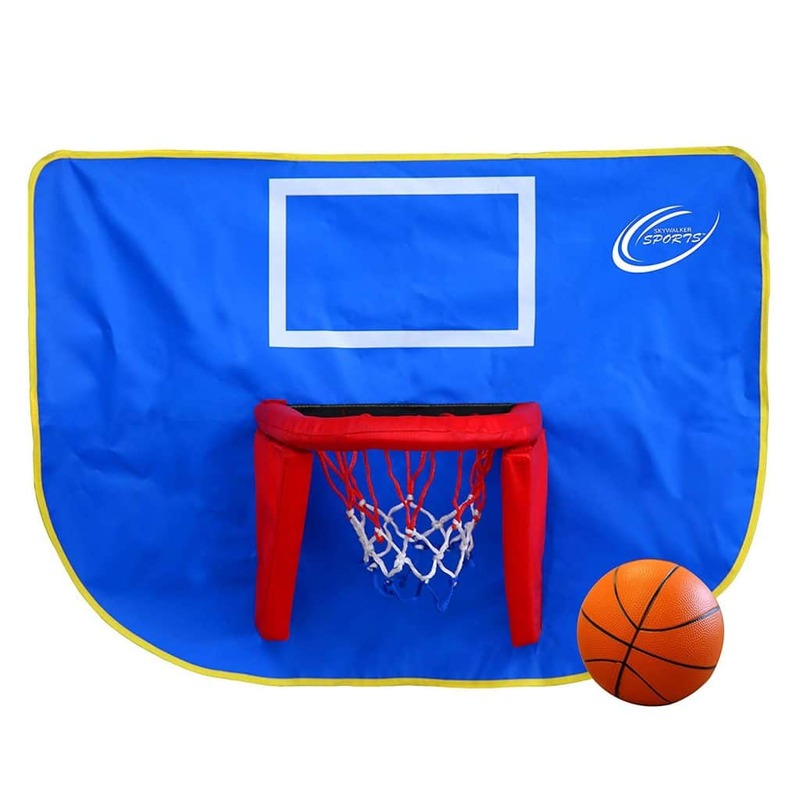 Unlike traditional trampoline basketball hoop sets, this one attaches with Velcro rather than bolts. This makes it a little bit more versatile than other hoops, allowing you to move it around as you see fit. 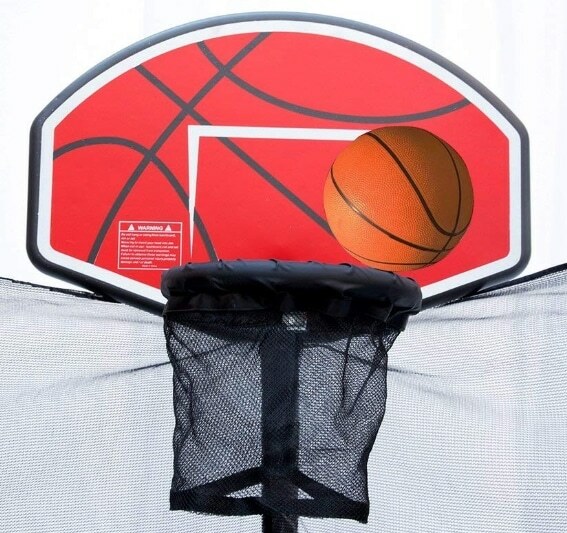 The greatest thing about this basketball hoop is that it’s completely customizable. You can send in your own design when you order with Zazzle, and it will be printed on the backboard and sent over to you straightaway. And the second-best part? This trampoline costs around in low range. Now that’s a deal to make you jump for joy. The Propel Jump and Jam is a versatile hoop. This set is designed specifically for Propel and Kinetic trampolines, but many customers reported that it fits with Skywalker trampolines as well. Make sure your trampoline safety net poles measure 28 or 32 mm in diameter before making your purchase. Like many of the other trampoline basketball hoops on this list, the Propel comes with a flexible rim for safety. 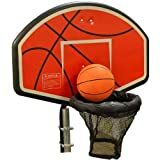 The backboard is sturdy and durable, though some customers said slam-dunking was a bit too much for this hoop to handle. The Propel model comes with its own basketball and air pump, so no additional purchases are necessary. At it's low range price, this hoop is a steal. A good trampoline basketball hoop provides the whole family with hours of fun. A bad one is a potential disaster waiting to happen. Online Reviews: Other peoples’ opinions are important. We take into account what numerous previous buyers have said to give you the most accurate prediction. Value for cost: Is it worth the money? We’ll give it to you straight by examining the features, durability, and what exactly you’re getting for your hard-earned dollar. Design: How your trampoline basketball hoop is made plays an important role in its function. We’ll examine its practicality, safety, usability, and attractiveness. Ready for the real skinny on trampoline basketball hoops? Check out these top ten hoops that make the cut. 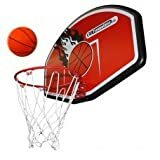 Choosing the right trampoline basketball hoop depends on your own personal needs and the trampoline you already have. If you don’t already have one, check out these tips on buying a trampoline. These will help you decide on the right one for you. If you do already have one, there are a few factors to consider when deciding on your purchase. Who Will Be Using the Trampoline? Will you be the primary playtime Michael Jordan, or will it be your significantly younger children? Keep in mind that while one trampoline basketball hoop may be for kids of all ages, another may be age-specific. The hoops designed for smaller children are generally softer, smaller and cheaper. They have more added safety features and are made using more fabrics and padding. The hoop sets made for older kids are made of sturdier materials like steel and hard plastics. Even so, you should choose one that has lots of safety features. Bigger kids play harder, which mean they’ll be banging up the hoop and backboard quite a bit more —you’ll want a breakaway or detachable hoop. Is Your Trampoline Compatible with the Hoop Set You Want? 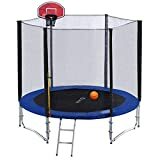 Most if not all trampoline basketball hoops are only able to be set up on a trampoline which already has a safety enclosure. That’s because most of them attach to the poles of the enclosure or the surrounding net. Examine your trampoline and its safety enclosure. Find out the shape of the enclosure and the diameter of its poles. Make sure they’ll work with the hoop set you want. When you know everything, there is to know about your trampoline, its time to make your purchase. Trampolines provide hours of much-needed outdoor playtime for kids of all ages and buying a basketball hoop just amplifies the fun. Making an informed purchase for your family ensures that your kids will be encouraged to get out there, get moving, and have fun doing it. So, what are you waiting for? Get your trampoline ready for the game. A trampoline is one of the best backyard products you can buy together with the trampoline anchors. They’re a fun way to keep you and your whole family in shape while providing hours of entertainment. They aren’t exactly cheap. However, they do require maintenance. The elements can really wreak havoc on your trampoline, so you’ll want to protect your investment as best you can. Did you know that your trampoline could tip over or even blow away during a storm? This could easily cause damage to your house or the property of your neighbors’. You don’t want that. So how can you ensure that your trampoline is safe and secure? Tie it down with trampoline anchors. These handy products ensure your backyard bouncy castle is safe from the elements, so you can rest easy when the weather rolls around. Confused about trampoline anchors are and how to use them? We’ll go over that. You don’t have to worry about choosing the best one, either. 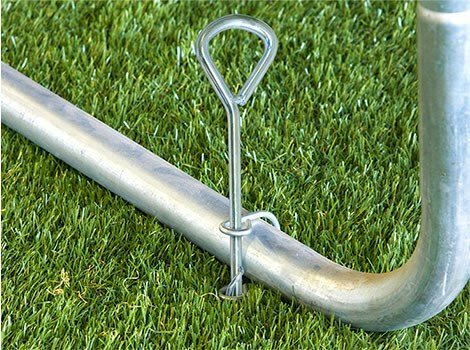 We’ve done the research for you and compiled a list of the top 3 anchor kits on the market. 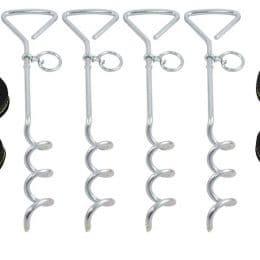 What exactly is a trampoline anchor kit? 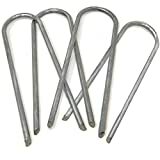 Usually, a kit consists of four tie-down straps and four stakes, also known as augers. The stakes are inserted into the ground to “anchor” the trampoline to the earth. The best ones are spiraled like screws, as this helps hold the trampoline in place better. Heavy-duty straps connect your trampoline to the stakes in the ground, effectively tying it down. When the wind picks up, the whole kit and caboodle keep your trampoline safe and sound. So which anchor kit is the best one? Check out our top picks for the best trampoline anchors on the market. These kits will ensure you have solid protection for your investment. The SkyBound anchor kit is one of the most highly-reviewed on the market. These four corkscrew stakes are about 15 inches long. 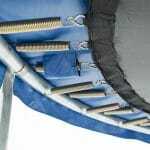 The length of the screws ensures that stronger winds won’t pull the trampoline out of place, while keeping the anchor easy to install and use. The augers are made of coated black steel, making them extra tough against the elements. The heavy-duty nylon tie-downs are 8 feet long, so you know you’ll have the length you need to anchor your trampoline securely. The straps have metal buckles on them, allowing them to be tightened and loosened easily. Customers loved the simplicity and solidity of this simple kit. The price is very reasonable. Remember, you’re spending this money to protect a much more expensive investment — so don’t be afraid to buy. The JumpSport trampoline anchor kit was a favorite among customers. Like the SkyBound, the Jumpsport comes with four straps and four screws to use as anchors in the ground. This easy-to-use system really packs a surprising punch when it comes to functionality. One customer even reported the kit held strong in 80 to 95 MPH winds. That’s edging up into hurricane territory, so you know this kit is ready to keep your investment safe. This kit is well worth the money. Those living in or near areas that have frequent tornadoes and hurricanes should definitely consider buying this product. It could save you hundreds of dollars on a replacement trampoline, or thousands of dollars in property damage. 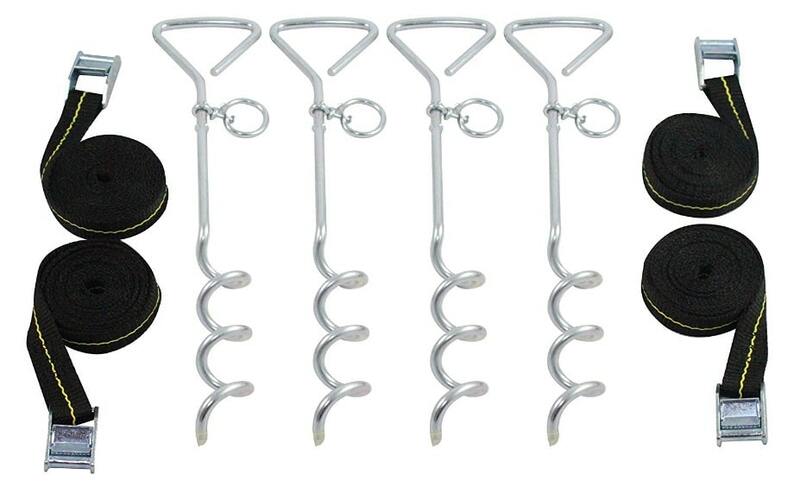 The Cajun Tie-Down anchor kit is another solid kit that customers highly approved of. The straps are strong and sturdy, made of 100 percent polypropylene webbing with UV protection. These straps aren’t going anywhere, nor will they rot during the rainy season. Buckles allow for easy tightening, and reviews stated that this product is simple to install. This is a very affordable kit. Customers reported it holds up very well during winds and works well for all types of trampolines. Wet the ground first. This will make it easier to push the augers in. Once the ground dries, it will be even more secure. Find out the measurements of your trampoline before buying. Unless you have a sunken trampoline, you’ll need longer straps to reach the ground. Make sure to install your trampoline anchor kit during good weather. If you think a storm is coming fast, it may be best to put the trampoline in your garage instead of trying to install the anchor kit as quickly as possible. You don’t want to be caught in a potentially dangerous storm. There’s nothing worse than fretting about potential property loss and damage during a storm. But you won’t have to worry if you take the proper precautions. By using trampoline anchors, you’ll be able to rest easy knowing that your trampoline (and your wallet) will live to jump for joy another day. If you haven’t experienced relaxing on a trampoline chair, it’s time to discover what you’ve been missing. Also known as Bungee chairs their unique design make them a fun, as well as practical, accessory to any office or home. Bungee chairs for the office tend to look more formal than the trampoline chairs on our list, but if your office fosters a more casual culture, then any on the list would be good to take to work. Trampoline chairs are known for providing great back support which makes them ideal for sitting at a computer for 8 hours a day. Despite their appearance, the best trampoline chairs are comfortable for people who suffer arthritis and other conditions. If they’re the right size for you, you should be able to sink into them quickly, and a small bounce will help you to get back up. Safety is always a concern with any product designed for children, and trampoline chairs are no exception. Even though most are suitable for adults, we are aware that these chairs are going to appeal to the youngest members of the household. In fact, we’ve added some to the list just for the kids. In compiling our list of the top 10 trampoline chairs we also looked at the price and value for money. It wasn’t much difference in price between the chairs so although the cost was considered; it didn’t have a huge impact on how many stars we gave each model. We’ve also considered the length of the warranty. 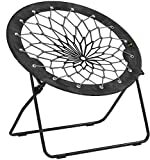 Weight capacity: 225 lbs; Assembled dimensions: 26" x 32" x 33"
Not only does it look good, but this bungee dish chair is a great price as well. It consists of a powder-coated steel frame with bungee cords of high intensity and quality. The chair is waterproof, so you can leave it outside without worrying about the weather ruining it. 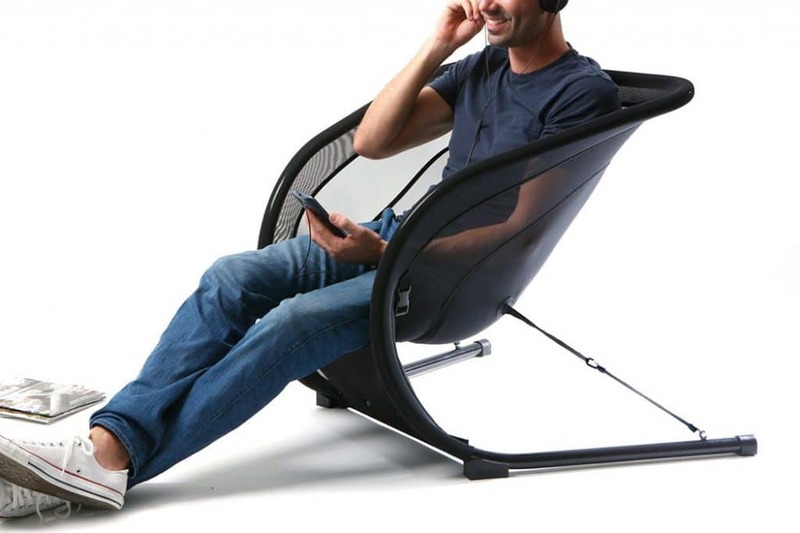 The dish chair weighs only 10 pounds and folds up easily so you can move it around without any trouble. Suitable for children and adults, it comes in a bright teal color. It’s the perfect trampoline chair for BBQ’s, camping, and parties. Available to buy in pink or black this model from Pearington Sports is a hexagonal shape and the seat has a flexible web design. It folds up into a portable shape and is stylish enough to fit in any room or with any décor. It’s also sturdy enough to take camping. Even though it’s a heavy-duty model, this model is still light enough to be carried around easily. It’s black in color so will go well with most color schemes and holds a weight of 225 pounds. The frame is made from powder-coated steel and the nylon bungee cords give it the elasticity it needs to provide the maximum comfort and bounce. It’s the perfect choice for both adults and children. 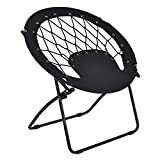 The Bunjo 360-degree bungee chair has a nylon mesh center attached to a rust-resistant steel frame. It comes in turquoise and purple and is suitable for adults and children. It folds down for easy storage and movement and when it’s assembled it uses a safety lock which means that it stays open. It’s comfortable enough for the dorm room and stylish enough for home living, and it’s reasonably priced. 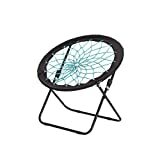 The Zenithen Bungee dish chair (model number IC544S-TV04) is another one that comes in the very popular teal color. It sports a black polyester rim and folds up into a handy size for storage. At a weight of 7.7 pounds you can easily chase the sun around the porch or backyard. 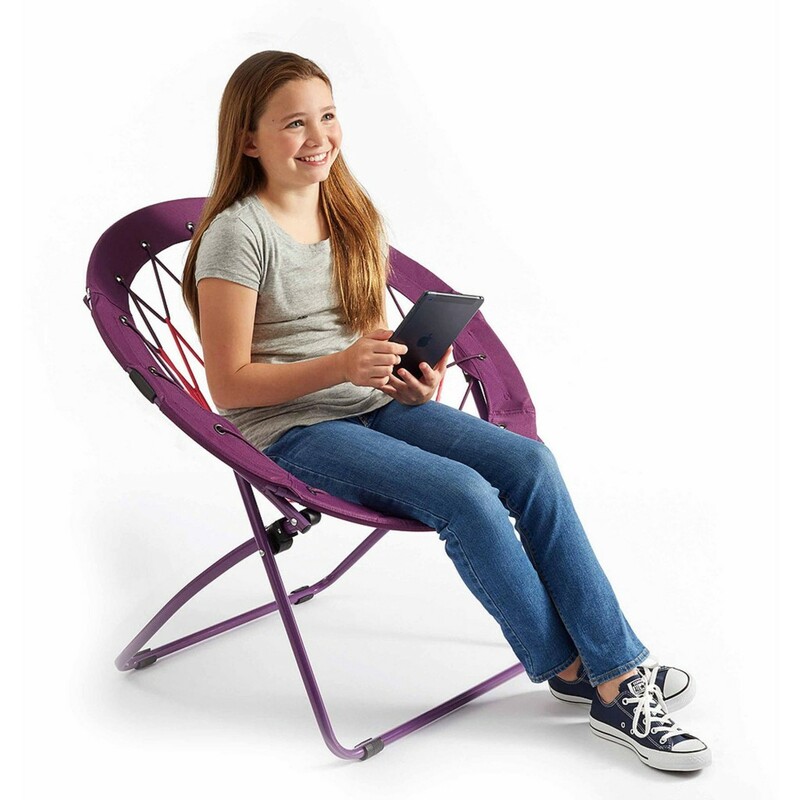 The web chair is perfect for children and teenagers, but adults love it as well. It comes in turquoise and pink and grey versions. The seat is made from durable Polyester and is supported by a 16/19mm steel frame with tube brackets and powder-coated legs. It folds down easily and is light enough that you can wader from room to room with it in one hand. Its strength of fabric makes it great for camping, relaxing, beach parties or BBQ’s. The Giantex trampoline chair comes in black, gray and a fantastic camouflage pattern that the kids will love. It folds up easily and is a lightweight style, so you can move it inside and outside as much as you like. The Giantex chair (model number HW53054BK) comes already assembled and its steel frame provides maximum strength helps the chair to easily carry a weight of up to 264 pounds. Perfect for any Hello Kitty fan! 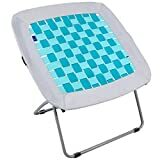 This is a gorgeous trampoline chair for the youngest family members in the house. 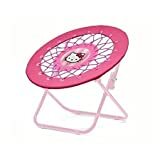 It has the bright pink Hello Kitty design on its canvas seat and it’s supported by a sturdy steel frame. It folds up for easy storage, so your Hello Kitty fan can take it wherever she chooses. 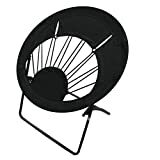 The Impact Canopy Bungee Chair comes in black, navy blue, grey, yellow and camouflage green. The seat is made from 600 weight denier fabric and it’s supported by a steel tube frame of a high strength and quality. 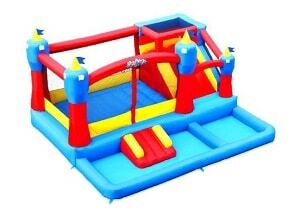 The kids will love this model for its bounce and the adults of the house will love it for its comfort and style. Holds up to 165 lbs. If the Hello Kitty model doesn’t appeal to the kids in the house perhaps the Spiderman one will. A great idea for the budding super-hero it sports a canvas seat supported by a strong steel frame. 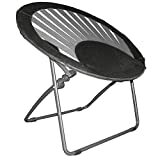 A good trampoline chair is one that will support your weight comfortably, is safe to use and is easily transported. If you plan to take your chair camping, there are other factors you should consider but if it’s just for the kids to watch movies in, you probably won’t need to worry about it being waterproof. Is the seat made from a durable fabric? If you intend to leave your trampoline chair outside, you’ll need to choose one that’s waterproof and that has a rust-resistant frame. However, we do suggest that you store your chair under cover when not in use, as whatever fabric it is made from, it will fade in time. 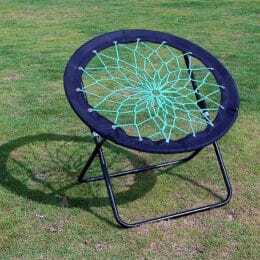 What color or shape of trampoline chair do you need? If you camp or hunt, you may want to invest in a camouflage styled chair so that you will blend into your surroundings. Camouflage is also very popular with kids and teenagers. 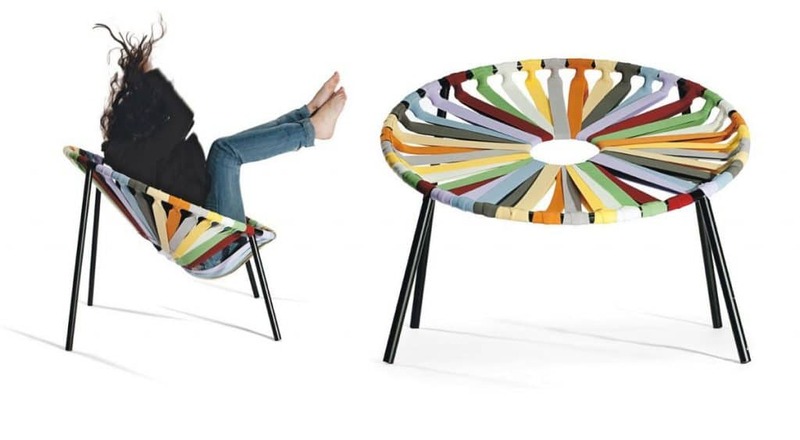 If you’re looking for a trampoline chair to use in your office, then the color is probably going to be a big consideration for you. Some trampoline chairs are obviously made for younger children, such as the Hello Kitty and Spiderman models that we included on our list. With other models, you probably need to check the specifications to ensure that your chair can support the weight of your 6-foot tall teenager. A chair may look to be more supportive than it is, so double-checking with the manufacturer is advised. We’re not saying that some of the newer brands of trampoline chairs aren’t safe, or good value for money. But purchasing a well-known brand product may entitle you to a longer warranty and may also give you more choice of colors, sizes, and materials. Once you’ve selected your trampoline chair, assembled it, and all the family has admired it. The last thing you need to think about is how you’re going to care for it. As we’ve already mentioned, although most trampoline chairs are waterproof, it’s still a good idea to keep it out of the weather when not in use. Most chairs will only need a wipe down occasionally with warm soapy water. With some models, it’s a good idea to dry them off after wiping, but waterproof ones are safe to air dry. We suggest you keep an eye on any springs or safety locks on your trampoline chair. Mainly if your chair is used for hunting these can get knocked about while traveling. And we all know that children can often be a bit rough with their belongings. With some of the bigger brands replacement parts may be available but if you do find any breaks your first step should be to check if it’s covered by the warranty. 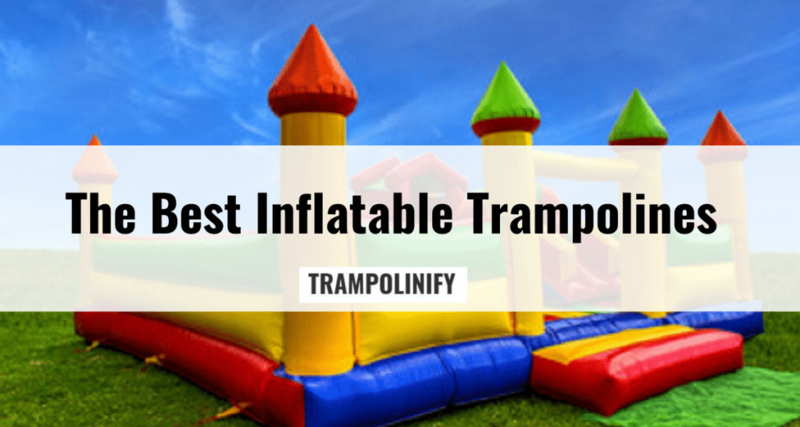 If not, it may be time to have another look at our list of the 10 best trampoline chairs and treat yourself to a new one. The wonderful thing about the internet is that we now have access to an almost unlimited amount of information. This means that we can do most of our pre-purchase product viewing from the comfort of our own homes. If we choose to, we can literally spend hours looking for the best trampoline tent and covers before heading out to the store to buy. But sometimes the choices that the internet gives us can be overwhelming and we’ve all heard horror stories about shady dealers and faulty goods. If the idea of spending your valuable time scouring the internet for trampoline tents doesn’t appeal to you, this is the list that’s going to make your day and should keep the kids happy as well. In selecting our entries for our top 10 list of the best trampolining camping tents, we’ve tried to add variety as possible. Quality and price were also important to all of us, so we’ve made sure to include some of the more budget-friendly options as well as, the more expensive. We added some lower star entries; it’s because we think these have some excellent benefits and we’ll leave it up to you to decide if the pros outweigh the cons. We’ve given our trampoline tents ratings between one and five stars, due to customer reviews, quality, and price. Only one of the tents on our list achieved five stars; most were around the 3-star range. Some were rated lower because they were limited in the number of models they could use. Therefore they were not very versatile. These are the trampoline tents that we believe to be the best of the bunch. We strongly recommend that you also check the length and type of warranty that comes with your trampoline camping tent. 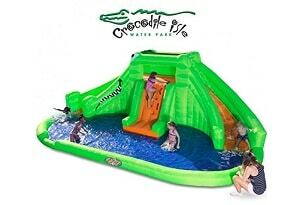 This is a fabulous choice for the young ones and the young at heart. The Big Top is 11 feet wide, 5.5 feet tall, and has 8 sides, and looks just like a small circus tent. 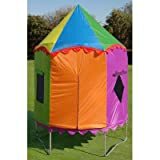 It’s the perfect size for 4 or 5 adventurous kids to camp out in and the bungee cords ensure it closes safely so there’s no mishaps during the night. The Big Top is zippered and comes with a full floor. It has double-stitched seams to provide a high-quality finish around the screened and netted windows and doors. 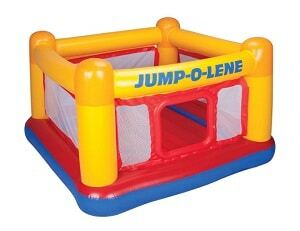 The Big Top is only for use with JumpSport Safety Enclosures. 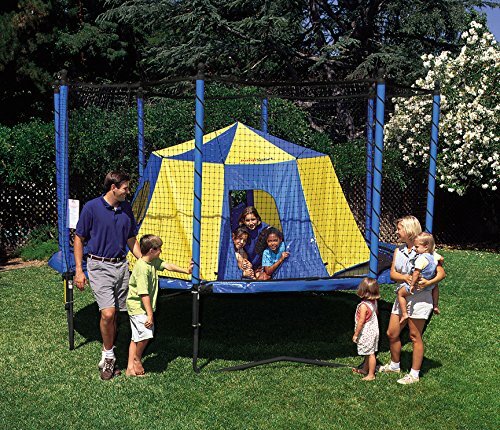 Made from CPAI standard polyester, this trampoline tent is a safe option for the kids. It comes with a fiberglass pole as its internal frame for the top and is only compatible with the Bazoongi Jump Pod Unit. Developed with the Bazoongi’s patented and unique G3 enclosure system. This is one of the safest trampoline tents we could find. Fits only with JUMPKING JumpPOD 7.5' trampoline enclosure. Made in China. Another circus-themed trampoline cover that the kids will love. This one has a zipper at the side making it easy for them to get in and out of. Only suitable for use with Jumpking’s JumpPOD trampoline enclosure it also has mesh windows to provide some fresh air inside. 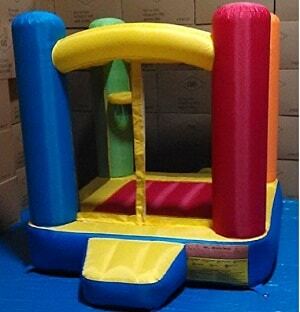 With bright and cheerful colors, what child wouldn’t want to bounce around inside? Advertised as the best fort ever, the AlleyOOp Outback trampoline tent is 11 inches wide and 5.5 inches tall. It doesn’t have any poles to set up can be installed within 3 minutes. For ventilation it has 3 windows and 1 door, all with screens ad zippers. The Outback trampoline tent is only suitable for use with AlleyOOp and JumpSport 12inch and 14inch round trampolines. It can be installed in 3 mins. One of the more expensive entries on our list of 10 best trampoline tents but this is also one of the best combos. Designed for the youngest family members its U-shaped legs sport a T-weld shape that easily holds up the hexagon-shaped frame. 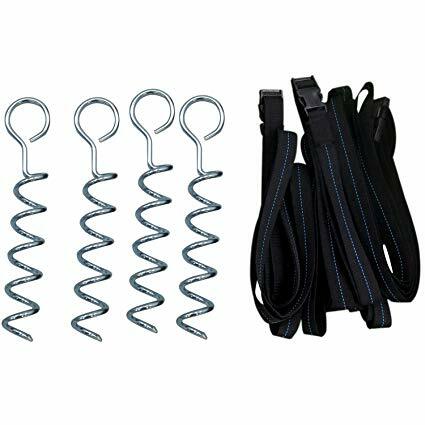 The trampoline and tent combo comes with 36 R-hook springs that measure 3.2mm X28mm. The galvanize poles are rust-resistant and have foam padding for added safety. The enclosure is covered with polyethylene mesh and the tent has a zippered entrance. This is a high-quality trampoline tent from Acon which is designed to fit most 15-inch round trampolines. It’s easy to set up and take down and is recommended for children age 3 and up. This is so much more than a trampoline tent: it’s a club house! It’s the perfect size for a hideaway at 180 inches wide, tall, and deep. It has a zippered entrance with 3 screened windows, each with its own adjustable cover. The walls are weather resistant so there’s no danger of the kids getting soaked when they brush up against the sides. It’s easy to assemble and comes with ties to secure the cover to your trampoline. 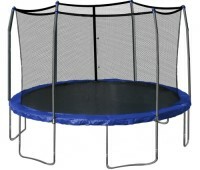 The trampoline club house is only suitable for use with Propel and Kinetics 15-foot round trampoline, which has 6 poles. 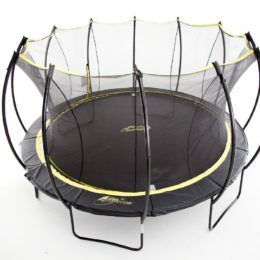 The trampoline model numbers are p15da-re, k15da-be, and ptsa15-108. Made from weather resistant polyester, the Tree House trampoline cover is perfect for kids with a wild sense of adventure. It has a zippered front entrance, a screen window and even a night sky roof. 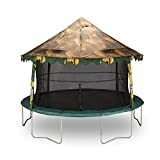 The tree house is only suitable to attach to the 10-foot Jumpking trampoline, model number JK1044. Dimensions: 144L x 144W in. The 14-foot tree house canopy covers a length of 144 inches and a width of 144 inches. 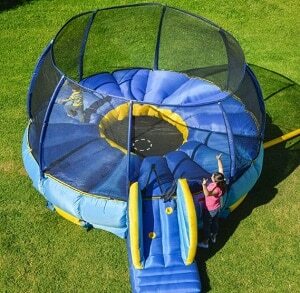 It’s only suitable for use with the Bazoongi 14-foot round trampoline. Made from fiberglass and polyester mesh, it comes in several colors. 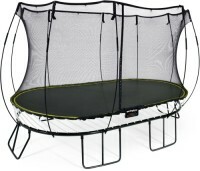 Only suitable for use with Kinetic and Propel Trampolines, model numbers p12-6ge and k12-6be. Provides plenty of cover and shade so that the kids won’t be affected by the weather. It’s very easy to assemble and ties securely onto the trampoline. Trampoline tents are fun places for the kids to hang out, without Mom worrying about them getting sunburnt or catching a cold from the rain. The perfect trampoline tent should provide safety and shelter as well as well as encouraging your child’s imagination and sense of adventure. 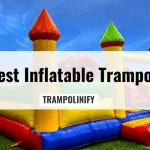 Here are the things you should consider when looking for a trampoline tent. Will the tent fit our trampoline perfectly? Most of the trampoline tents on the market are made to fit specific models of trampolines. This is to ensure that the tent fits perfectly, lessening the risk to your child and the risk of damage to the tent cover. Is the tent made from weather resistant fabric? 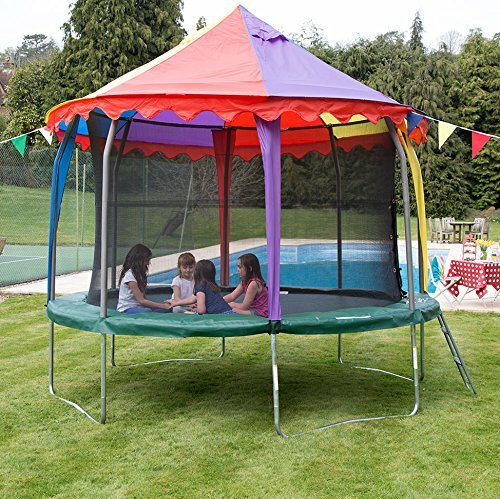 The trampoline tent should provide shade from the sun but should also be waterproof. The tougher the material the better, particularly if you live in one of our tornado-prone areas. Does the tent have enough ventilation? This is extremely important as kids tend to get caught up in what they’re doing and lose track of time. The air in a small covered space can become dangerous to a child, very quickly. Is the tent easy to get in and out of? This too is important. 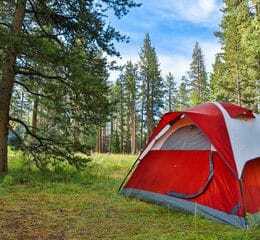 You need to know that your child can get out of the tent quickly if needed. Check that the zipper to the tent moves up and down freely and easily. Is the trampoline tent easy to assemble? You don’t want to spend hours putting the tent together, it should slip over the trampoline easily. Is the tent age appropriate? This may not seem important, but the trampoline tent must be one that your child is happy to use. It might be the safest shelter in the world but if your kids refuse to use it, then it’s not going to be of any value at all. Are there enough ties to secure the trampoline tent? It’s also a good idea to check if replacement ties can be purchased as these are often misplaced. 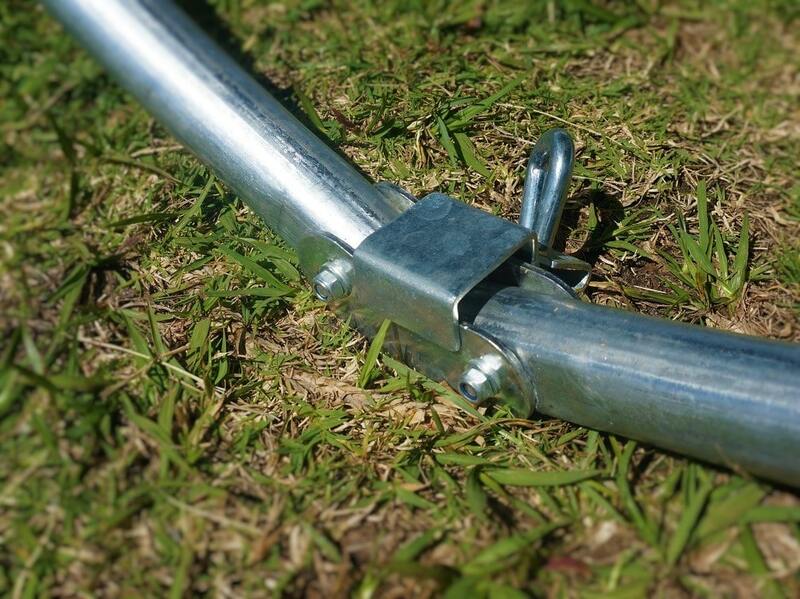 Consider using bungee cords instead of ties to lessen the risk of the tent becoming unsecured. The latest figures state that 1 in every 3 children in the United States is overweight. 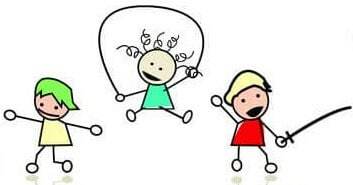 Therefore, it’s so important that children spend time being active. Trampolining is a great way for them to get exercise while having fun. Jumping is good for your child’s physical development and helps to develop their fine motor skills. Their muscles will go stronger and their coordination will improve. Outdoor play gives kids a chance to make as much noise as they want and to let off steam in a safe way. This helps them to concentrate at school and improves their learning. An overnight camping adventure with a friend or two help kids to develop their social skills and learn how to manage relationships. It also gives them a sense of independence while still being just a stone’s throw away from Mom and the home comforts. A well-made trampoline tent will keep them safe, warm, and out of harm’s way. As much as we want our children to be fit and healthy we also want them to be safe and protecting them from the weather is part of the protection we need to provide. But that doesn’t mean protection has to be boring. Wouldn’t it be easier to entice your child into a camping adventure in a tree house or clubhouse, than trying to get them into the shade for their own good? Trampolines! Almost every kid loves them. They get kids active and help keep them healthy. 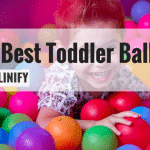 You can agree with us that most parents are happy to see their kids playful, whether jumping inside a trampoline or playing games with their friends. 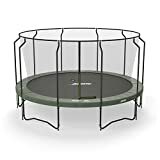 ACON Air 4.6 Trampoline 15 Review- Is it Worth it? Founded in Finland back in 1996, ACON offers a wide range of innovative and high-quality products that drive people outside playing games. They started by importing trampolines into Finland and they have expanded into manufacturing over the years. 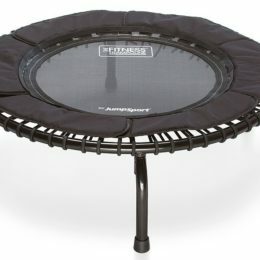 A good fitness trampoline is hard to find. A lot of workout routines involve using some sort of a rebounder, and you can’t use a full size trampoline for this kind of exercise. You’ve probably never seen anything like the SkyBound Stratos trampoline before. Due to growing safety concerns of parents, a lot of trampoline manufacturers have made an effort to create safer trampolines for children. Safety enclosures are one of the most popular accessories for trampolines. 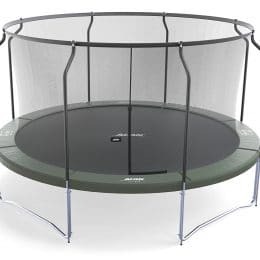 In fact, most trampolines already come with a safety enclosure.